Whether it’s security, privacy, or just aesthetics that you’re looking for, we have a variety of different fencing options to choose from to suit your home and design correctly. So if you’re on the hunt for a new fence, take a look at our different fencing options to find the best fit for your home. This 1st-grade pressure treated spruce is a superior material that is exceptionally durable, even when it’s in direct contact with the ground. Pressure treated fencing does not require any additional coatings to reseal it, however, the colour will begin to naturally fade over time due to exposure to the elements. But thanks to the durability of this material, it has an impressive lifespan of 25-50 years. This is another popular premium 1st-grade lumber that is sourced right here in Canada. Cedar is a beautiful, natural wood that’s rich in colour and is always a favourite among homeowners who are looking to incorporate something that’s functional and aesthetically pleasing. Similar to the pressure treated fencing, this also does not require additional coating and can remain natural and beautiful, even as it begins to fade in colour over the years. This style of fencing is very practical and popular for both residential and commercial areas and is ideal for creating a barrier without blocking out the view. The standard height of these fences is 5ft. However, there are other options available to best suit your needs. Fencing for commercial locations can be more tailored with a broader range of choices. Every final product includes tension bars, bottom wire and top rails, which are built according to the manufacturer’s specifications. 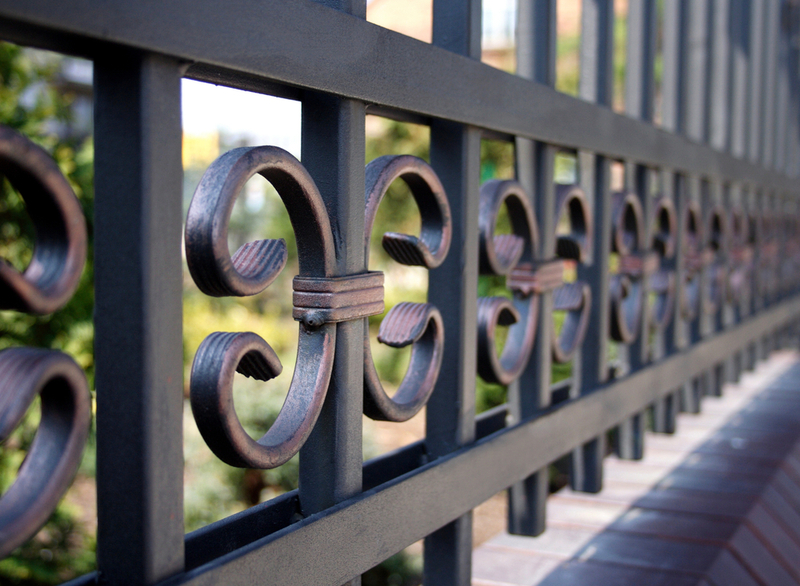 If you’re looking for a fencing material that will really enhance the curb appeal of your home, then the ornamental iron fence is always a winner. Iron fencing is without a doubt, a classic and elegant looking addition. Plus, it is firm and durable thanks to the corrosion-resistant steel. Alternative colour and height selections are available, however, the standard design includes a 5ft height with 8ft panels that include pyramid posts and a black finish. PVC is also a very resilient material that can last a whopping 25 years, depending on the environment. It does require a little bit of maintenance in order to get the most out of it, which entails a quick cleaning twice a year with mild soap and water. With steel and aluminum inserts, this fencing style receives extra reinforcement, which makes it a premium selection for security purposes. You can tailor the design and choose from numerous colours to best suit your home. This patented design includes specialized rotationally-moulded fencing that combines a natural looking stone façade with extra durability and functionality. So if you’re in need of a fence that looks as good as it performs, this could be the best option for you. With reinforced galvanized steel throughout each panel and UV12 inhibitors to protect the coating, this fencing material can withstand intense hurricane-force winds, and keep the colour looking sharp for a lifetime without fading. All of these factors combined make this one of the most user-friendly fencing options today. When it’s time to have a new fence installed, the material, style and functionality really matter. That’s why it always helps to have the experts by your side to assist you from the design phase to the installation. At Fence Masters, we take pride in the quality craftsmanship and excellent customer service that we deliver, which has allowed us to maintain the glowing reputation we have today. So when it’s time for a new fence, allow us to help. Contact us today!